Master storyteller Laura Simms returned to Pono and mesmerized the children with two tales. They listened raptly as she skillfully built the suspense and brought the stories to their satisfying conclusions. Zoë led a class about celebrating Ganesh Chaturthi in Mumbai, India. She shared photos of this colorful festival honoring the elephant god Ganesha and told us about traditions associated with it. She even had a little Ganesha for each of her Pono friends! Alex Kramer brought his banjo back to Pono and had us square dancing up a storm! He taught us the folk song "Goin' to Boston" and several Pono friends could be heard singing "Saddle up, girls, and let's go with them" throughout the day! Dee Leconche shared her recipe for pumpkin tarts, and the children expertly rolled, filled, and crimped the dough. What a perfect autumn treat! Dr. A and our littlest Pono friends made their own fossils! Using clay and specimens (shells, bones, sticks), the children made imprints to mimic how fossils are made. 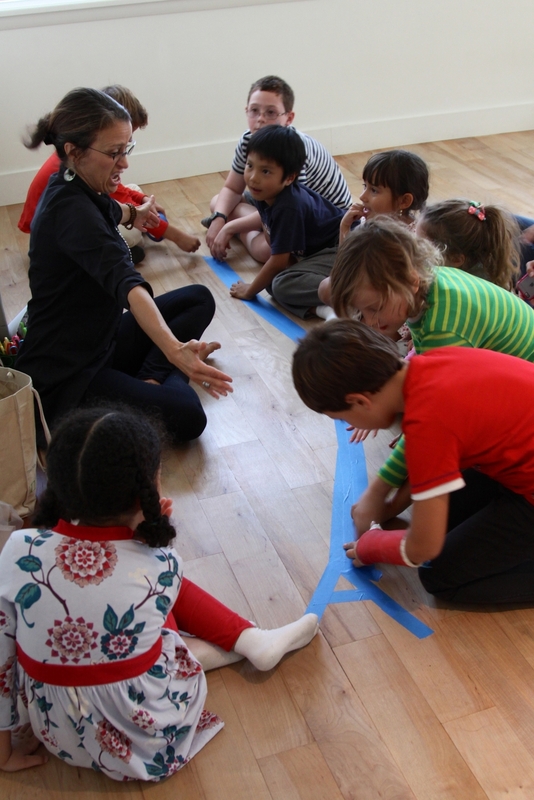 The older children and Dr. A used tape to create a Hudson River on the floor that mirrored a map of the Hudson. Using jarred specimens, they plotted what lives in and along the Hudson and discussed the food webs that exist in the river, the role of trees in stopping erosion, and how the lower Hudson is a mix of fresh and salt water. Cindy Marchionda and her British cream golden retriever, Sofia, visited our youngest Pono friends this week. The children had a "pawsitively" wonderful time brushing, petting, and hugging Sofia. Cindy and Sofia are part of New York Therapy Animals, a nonprofit organization that brings animals to schools, hospitals, nursing homes, and other venues. This week in literacy Pono's older children continued their word family study, while the younger group finished writing their Who book. The older children worked on division, multiplication, and addition. The younger ones played "I Sea 10" with Maysaa to find matches of two sea creature cards with numbers that make ten, and they worked more on time and money. Kate guided some of our littlest Pono friends in counting and writing numbers. Mark Reibstein's book Wabi Sabi, about a cat that travels across Japan to discover the meaning of her name, inspired our youngest Pono friends to make cats out of clay. Their feline creations are beautiful by any name! You don't need a darkroom when you have a sunny park! Ali taught our littlest Pono friends how to make sun prints of leaves they collected in Marcus Garvey Park. They used solar paper to capture the images and then dipped their paper in water to save the prints. True nature photographers! The children also gathered around Ali as she sang "This Little Light of Mine." These Pono friends truly let their light shine! What's better than making a sculpture? Making a sculpture you can eat! The younger children and our littlest Pono friends made dough with Ali and Kate and created lovely edible art. Did you know there is a farm right in our neighborhood? On Monday we visited Harlem Grown on West 134th Street, where urban farmer Lydia Nebel welcomed us. She and her colleagues gave us a tour of the farm and its hydroponic greenhouse, where we admired rows of produce and sampled fresh basil. We also met red wriggler worms from the farm's compost bin! We celebrated Pono friend Halina's birthday with a trip to Central Park's Harlem Meer. Urban park ranger Edward "Teddy" Dennihy-Bailey discussed the biodiversity found in the park and let us get up close and personal with a stick insect! We also hiked in the North Woods, enjoyed a picnic lunch, and had fun in one of the park's playgrounds. This week the comic book team made further strides in fleshing out plot points and new characters for Chapters Three and Four. The plot thickens! Meanwhile, catchy melodies and lyrics filled the air during Jesse Featherstone's songwriting class. We look forward to hearing more! Our next information session will be held on November 20th at 2pm. Is there anyone you would like to invite to learn more about Pono? Pono parent Sheri Graubert let some of us have a sneak peek of the Pono cookbook and it made us very hungry! Copies will be available for purchase soon. Visit pono.nyc, Facebook, Instagram, and Twitter for all of the latest Pono news!